MOCAP.com has been upgraded to include new "Live Chat" feature. 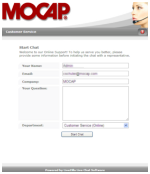 This new web service allows MOCAP to communicate and engage directly with customers on our website, and answer any questions they might have regarding our products, and the status of existing orders. This real-time chat system will allows our customers to interact quickly and easily with our support staff, and allow us to provide a high level of customer support to our customers. This new system offers many advantages for our customers. Our new online tool will provide customers with easy access to information that they would have previously required a lengthy phone call or a long series of back-and-forth emails. Online chats are an efficient means of communication, and allow for quicker communications than traditional e-mail, while providing the spontaneity of a phone conversation without tying you down to a phone line while you wait for us to research your question. Additionally, the text of a live chat is precise, making it easier to understand (and less subject to misunderstanding) for both the operator and the customer. Plus, it provides the customer with a written record of the conversation, which can help avoid potential misunderstanding later on. This new system greatly enhances MOCAP's ability to provide better service to our customers. MOCAP is the Leader in Plastic & Rubber Masking, Product Protection, Components, and Custom Molding. MOCAP's dedication to serving its customers and providing the best quality products at competitive pricing has provided with a clear competitive advantage, and this new service will further strengthen our ability to effectively serve our customers.